New churches in New York have become a rare thing indeed – at least in the urban part of the New York Archdiocese. 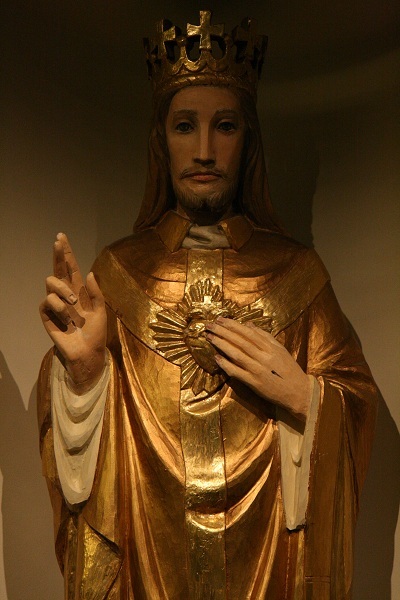 Yet one such edifice has arisen quite recently – the new Chapel of the Sacred Hearts of Jesus and Mary. The first mass was said here in May 2009. Moreover, this chapel and the attached residence, we understand, do double duty as the retirement home for Cardinal Egan. So we can assume that the Archdiocese spent more than the usual care in supervising the construction of the new chapel. So, we ask ourselves, what has the Archdiocese learned from the architectural vicissitudes of the last 45 years? What sort of wisdom has it gleaned from the spasmodic attempts that have been made in this period to continue Catholic church architecture – from the vacuous modernism of St. John the Evangelist to the would be classicist revival of St Agnes to the Byzantine renovation at Our Saviour’s? 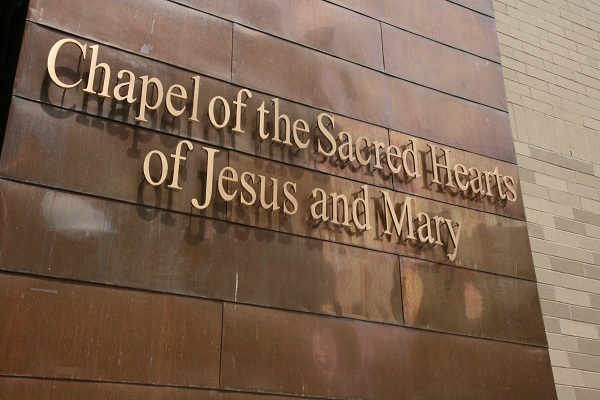 The Chapel of the Sacred Hearts of Jesus and Mary is the successor to the parish of the same name. One of the least-known parishes in Manhattan, it was a relative latecomer, organized in 1915 to serve a predominantly Italian congregation. Its small beaux-arts church, completed in 1916, boasted some nice windows but little else; unusually for a Manhattan church, its interior and especially the sanctuary had undergone a drastic post – conciliar “renovation.” Another unusual feature of Sacred Hearts parish was that this church anchored a whole block of buildings: rectory, convent, school and even a high school! This type of parish complex is fairly common outside of New York City in locations ranging from Chicago to New England mill towns. 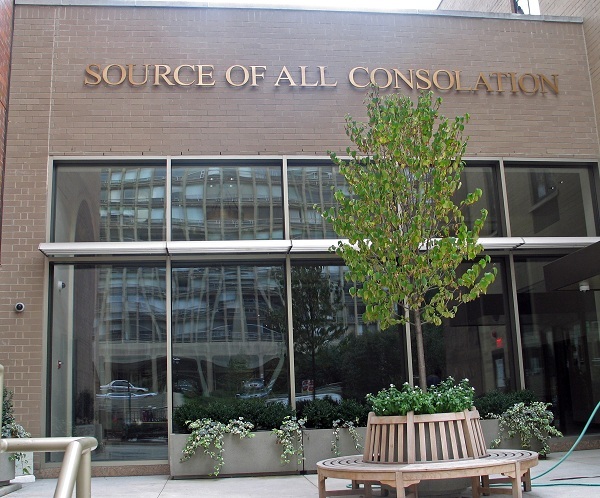 The high cost of land in New York City, however, made complexes like Sacred Hearts a rarity – only certain churches of religious orders can compare. The most intriguing of the Sacred Hearts buildings is what I believe was the former convent – in a brick Art Deco style, it was reminiscent of the 1930 St. Catherine of Siena. Gradually all the buildings except the church and the rectory were vacated. The modernist “renovation” did not help. Finally, Cardinal Egan closed the parish in 2007 and razed its buildings. 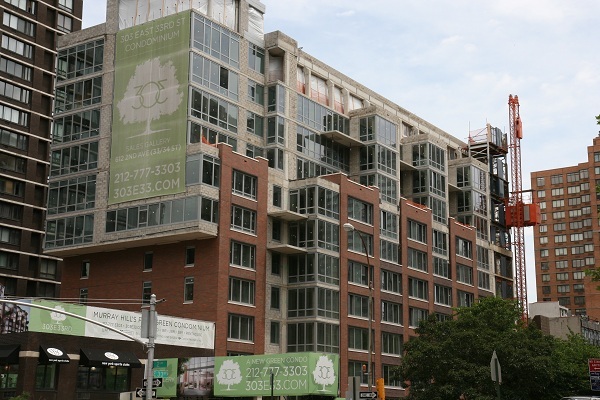 Most of the block was thereby freed up for luxury condominiums. But squeezed into a sliver of the former parish grounds is the new chapel. 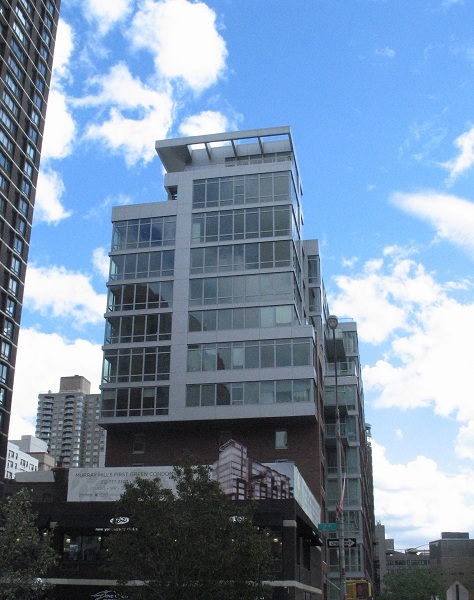 Doin’ deals – luxury condos under construction in 2009 on site of the former parish and (below) finished. The chapel is unrecognizable as a church from the outside: only the metal lettering and a cross give away its function. Only the facade of the Church of the Nativity (1970) can complete with this studied anonymity. Inside, it is nothing more than a lecture hall as found in some college or corporate conference center. 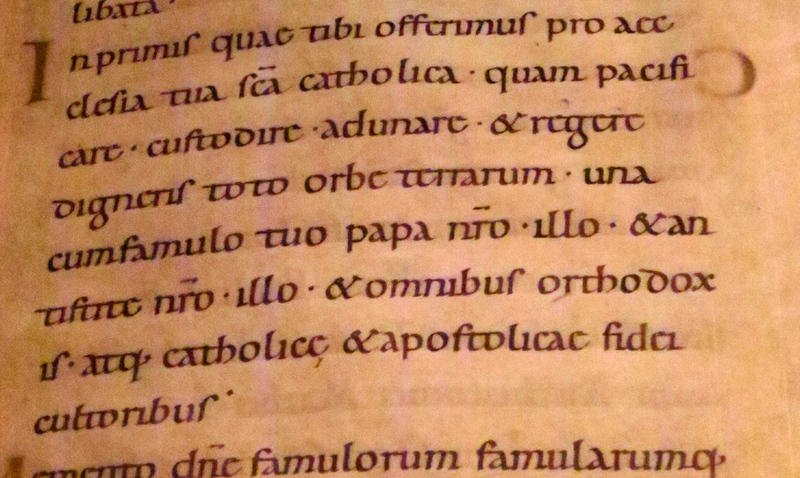 All is bathed in bright light from the large window that makes up one side of the chapel. The people of the congregation look down upon the sacred mysteries from which no altar rail divides them. 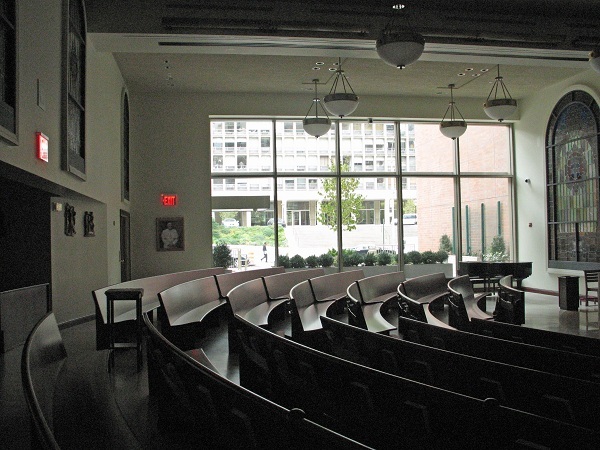 Thus, in all essential respects, Sacred Hearts Chapel regurgitates the original dogmas of ecclesiastical architectural modernism as practiced up till the time money ran out in the 1970’s. 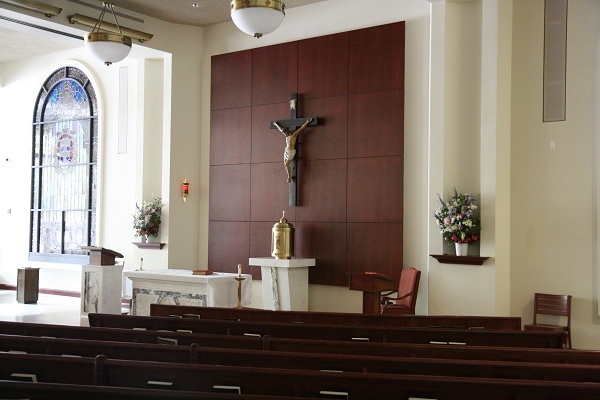 The only divergence from the early days of architectural radicalism is the embedding of elements of traditional art (like the altar, statues and windows of the old Sacred Hearts Church) into the anonymous, institutional modernism of this chapel. 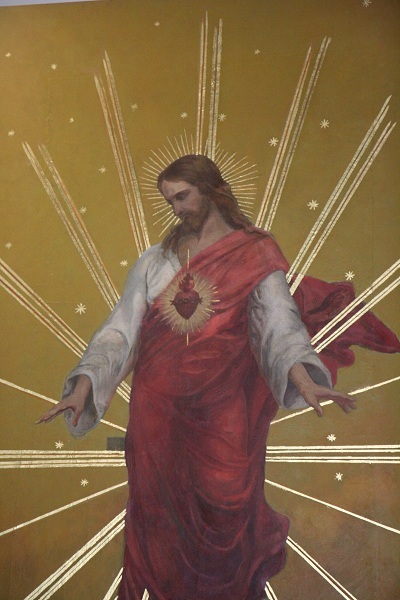 On one wall there also is an unsuccessful attempt to create a new image of the Sacred Heart of Jesus. 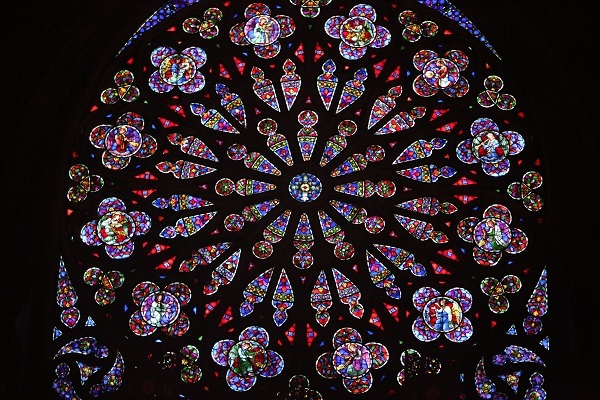 We have seen the same process at work at other modernist churches (like St John): the introduction of traditional artwork to “Christianize” the implacable face of modernity. In the vestibule of the chapel, moreover, we find further spolia from destroyed churches. 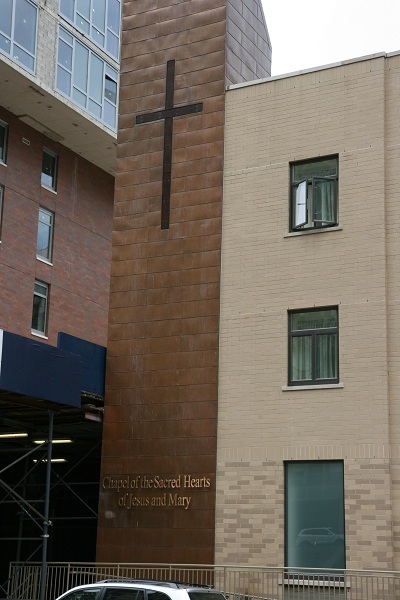 There stands the copper cross from the façade of the old Sacred Hearts parish. 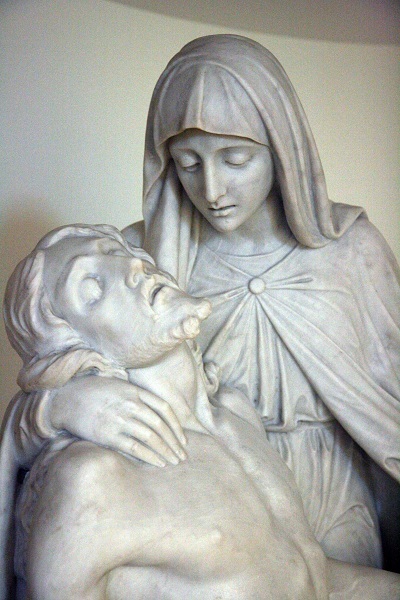 More outrageously, there is a beautiful pieta from the church of St. Ann (also destroyed by Cardinal Egan). I believe this was the parishioners’ memorial to Fr. Preston, one of the greatest priests of 19th century New York. 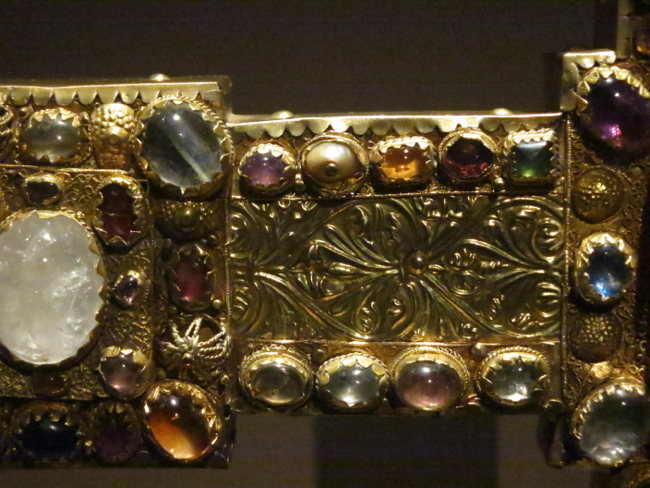 Here it has been stripped of its original dedication. 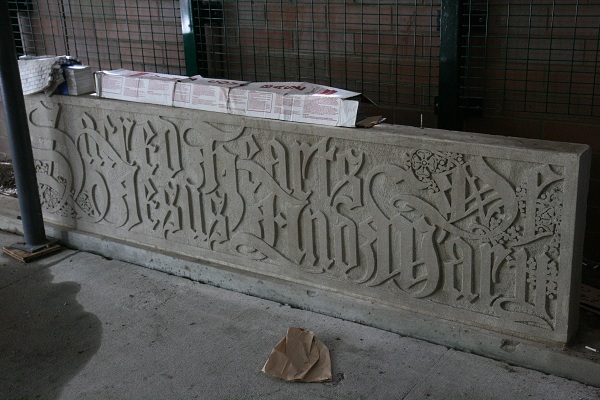 Inscription from the old convent (2009). Statuary from the original parish church – probably from a later restoration.